The time has come to put HIR3 and ourselves to the first real test. We have finally sailed offshore 300 miles non-stop from Poreč to Dubrovnik and then another 200 miles to Zadar. 5. It is obligatory for everyone to have a good time! We will sail around the World! If You would like to join us on board HIR 3, please read and accept our Terms and Conditions in the Crew Agreement and fill out the Crew Application form HERE! Definition of Skipper: the master of a ship; especially: the master of a fishing, small trading, or pleasure boat. 1. A good Skipper can tell you quite a few tips and tricks and you can learn how to maneuver the boat, trim the sails properly and anchor safely. 2. An experienced Skipper will plan the route for you, so you can swim in nice bays, visit cool places and eat in great restaurants. 3. A Skipper will be able to find a berth and anchor the boat safely where you otherwise couldn’t do it yourself. 4. In case of a breakdown (e.g. 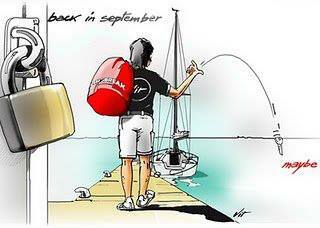 engine failure), a Skipper will know how to fix it, or will be able to find someone who can. 5. 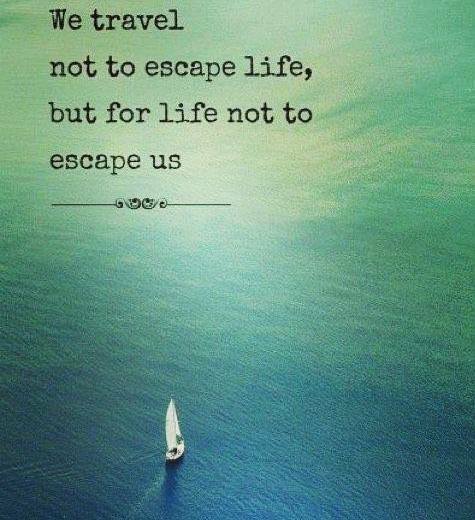 You can relax and enjoy your sailing experience knowing you are in good hands. 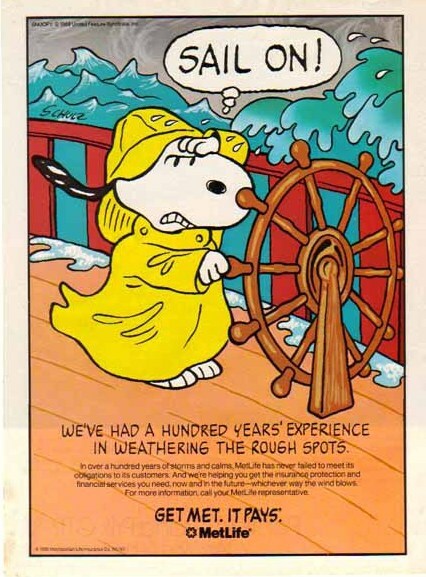 New Year’s resolution – SAIL MORE! 2016 is coming to an end, so maybe now is the best time to decide on a New Year’s resolution: More sailing! 2016 is coming to an end, so maybe now is the best time to decide on a New Year’s resolution. Well, Sherlock Holmes would say: ‘ It’s elementary, my dear Watson!’… More sailing! Wichard Offshore knife has a serrated blade that can cut through Dyneema, and is available with a combined shackle key/marlinspike. The Olaf Urban combines four products in one: a kick-scooter, a trolley, a backpack and a skateboard. It’s a cool way to ting around in foreign marinas and towns. Free Wheeling blends rowing with outboard motors to produce a clever lightweight solution for your tender. 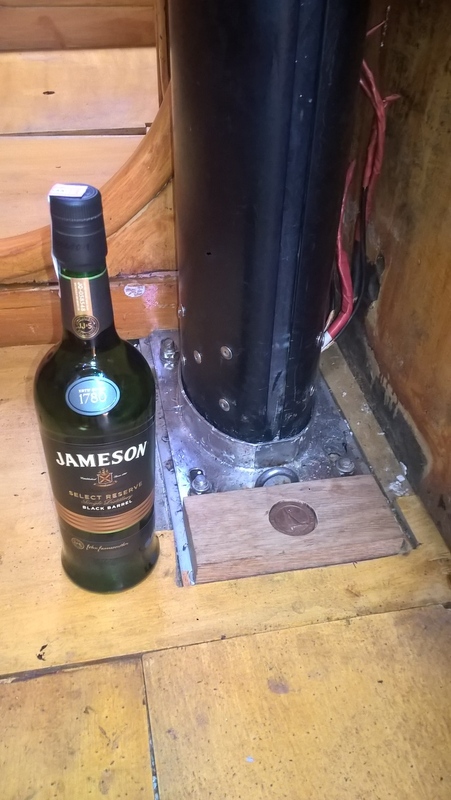 It uses a 3:1 gear ratio contained in the collar by the handle, driving a high-pitch propeller to provide a smooth, silent and fuel-less means of manual propulsion in either direction. The RAW Pro Head Torch is a waterproof, light weight, high power white and red beam head torch. Engineered specifically to excel in the harsh marine environment, you can rely on it in any situation. 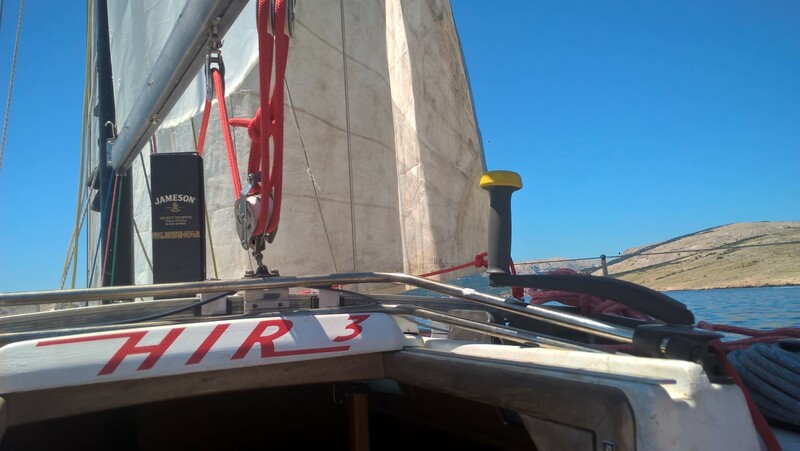 DrSails is a fast curing epoxy that can be used on sails plus most materials in virtually all conditions – including underwater – so it can even help patch a hole below the waterline. Spinlock 2 Clip & 1 Link Safety Line for staying safe on board. Up to 50% lighter and more compact than conventional safety lines. Musto Windstopper Hat is styled in the manner of a traditional woolly hat but with a technical twist, it contains a Windstopper membrane to cut out the windchill and keep you warm while maintaining breathability. Warm and comfortable in the coldest conditions. Stay ready for the expected (and unexpected) no matter where you are with everything you need to stay safe and take your adventure further with a Leatherman Signal. Dubarry Crosshaven sailing boots are offering optimum performance out at sea, these waterproof men’s sailing boots have an essential non slip sole and also feature a reinforced toe and heel due to the D-chassis system which adds extra support and protection. Garmin GPSMAP 64s handheld navigator features a 2.6” sunlight-readable screen and a high-sensitivity GPS and GLONASS receiver with a quad helix antenna for superior reception. It’s rugged and waterproof and comes with a barometric altimeter and a 3-axis compass. It wirelessly connects to a smartphone to allow Live Tracking and Smart Notification. GoPro HERO5 Black is the most powerful and easy to use GoPro ever, thanks to its 4K video, voice control, one-button simplicity, touch display and waterproof design. Strida is the first completely new bicycle geometry in 95 years. Inside a triangular frame, the power is transferred to the rear wheel via a silent clean Kevlar belt. The genius of the triangular frame is that it can quickly fold. SeaPack provides emergency hydration fluids from saltwater sources. Seapack utilizes a passive osmotic process and it is the easiest desalination technology available. The most rugged, durable, weatherproof phone and tablet recharger on the market, no rubber plugs needed. Charge up from USB or included solar panel. The Venture 30 packs the power you need to keep those small devices, cameras and tablets charged no matter the elements you may be out battling. With an IPX6 weatherproof rating and 7800mAh the Venture will keep everything running smoothly. The Scrubba Wash Bag is the world’s smallest washing machine, it is a modern take on the old fashioned washboard and twice as effective as hand washing. The designer Peter Jessen has again proven his ability with this Petrolux DELITE light in which he has combined technical perfection and solid hand-craftsmanship with wonderfully beautiful design. Stainless-steel body and shade, clean satin finish. In honor of the yachtsmen of Emirates Team New Zealand, OMEGA Seamaster comes in a limited edition of 2,013 pieces and features a regatta start countdown indicator, a matte black ceramic bezel, and a black rubber strap with red detailing throughout. The DeLorme inReach Explorer would be appreciated by any cruising sailor. This handy device lets the user not only share their location, but also send and receive text messages from anywhere on the globe using the Iridium satellite network. Strahl glasses is made of a high quality polycarbonate, a remarkable material that enables us to produce beverageware products with the clarity and elegance of glass, it doesn’t shatter, making it an ideal and extremely safe alternative to glass. Rudy Project sailing sunglasses offer protection from falls and knocks thanks to the Safety Project system, lightweight, thanks to the use of innovative materials such as Kynetium, Grilamid, carbon and titanium, protection from the wind and from any kind of shock thanks to the ImpactX technology lenses, guaranteed unbreakable for life. protection from UV rays and excellent vision in all weather conditions thanks to the polarized glasses with photochromic lenses. These, besides automatically adapting to any changes in light, eliminate glare caused by the reflection of rays on the water that fatigue the eye and facilitate reading of the instrument panel. 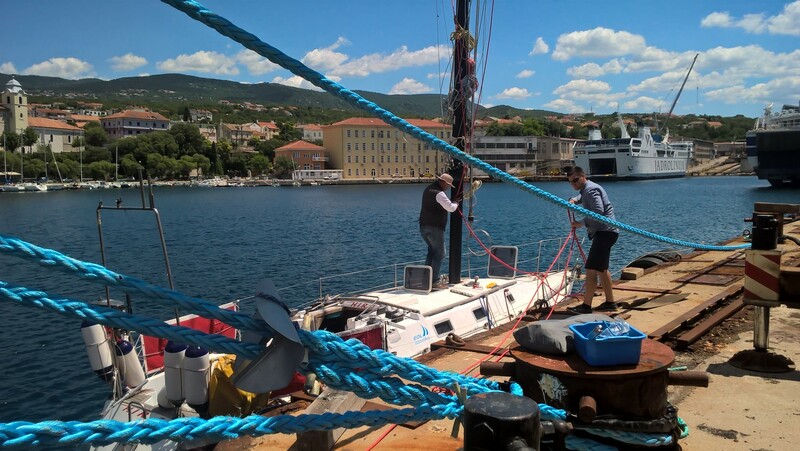 HIR has been in Kraljevica Shipyard on dry berth for almost three months now… I am a patient man, but even I became nervous and was thinking if I would ever set sail…. but then, finally… After we’ve put new antifouling, engine was fixed, mast step and all shrouds and lifelines were replaced, we painted the mast, put the new windex on top, roll system was serviced, new halyards were in place and mast was stepped and trimmed properly… we were ready to sail away:)!